Always looking to combine arts with practical skills, the Whole Earth Nautical Supply, located at 410 Washington Street, by the skate park, in Port Townsend, WA, is fortunate to have on exhibit the fancy knotwork of Jacob Borkowski. Borkowski is a Seattle based cabinet-maker who has been interested in marlinespike seamanship and fancy knots since he was a 14-year-old Sea Scout. 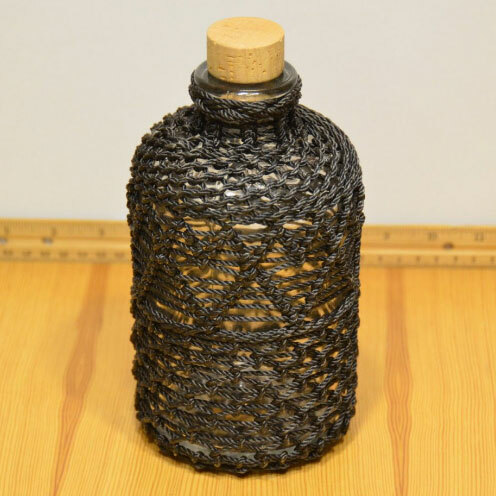 Every finger a marlinespike, Jacob’s specialty is covering bottles with intricate knotting. B.Y.O.B. and have it turned into a sailor’s practical work of art. No foolin’, there will also be music, treats and salty gifts in a warm, convivial atmosphere permeated by the delicious aromas of maritime tradition!